Bid On These Iconic Items Now. Legacy. Passed down from generation to generation, families keep items in their collection for sentimental, historic or monetary value. This 1937 World Series watch originates from the estate of baseball player and manager, Don Heffner. Surprisingly, the curation of his estate has remained intact for almost a century and is ready to be part of a new legacy. Don Heffner was a major league second baseman for 11 years with a .241 batting average (in 743 games). Highlighting the start of his career in the Majors, he was a member of the vaunted 1936 New York Yankees team. He batted in a lineup which featured the likes of rookie Joe DiMaggio and the “Iron Horse”, Lou Gehrig. The team was impressive winning their 8th pennant and beat the Giants in six games to win the ultimate trophy. Well deserved, Heffner added a World Series ring to his jewelry box (as well as the watch presented here). He spent four seasons with the team before going to the St. Louis Browns. By 1937 the New York Yankees were positively invincible. Veterans Gehrig and Lazzeri were now solidly reinforced by the youngsters DiMaggio and Henrich. But this team could have been burdened with mediocrity, and they’d still claim victory on the strength of their overpowering mound crew. It was in the course of that triumphant 1937 campaign that Don Heffner a member of the vaunted squad received this marvelous 1937 World Series watch. The custom timepiece is a mid-size 14K yellow gold Hamilton wind-up wristwatch. The case is rectangle and measures 30mm x 21mm. It features a champagne face with gold Arabic numeral markers and a rectangle second hand wheel at the 6:00 position. The movement is Hamilton ISA 19 Jewel 962. The back of the watch is charming as the bezel set features two round old European cut diamonds. Each diamond measures approximately 2.7 mm with an estimated total weight of .15 carat, both with SI-1 to SI-2 clarity and G to H color. It also features the historic victory details and his ownership personalization, “N.Y. YANKEES 1937 WORLD CHAMPIONS – DON HEFFNER. The watch is a black stainless steel stretch band (not original) with the serial number: 245851. Overall, a sensational historic timepiece from a memorable season direct from Heffner’s estate. 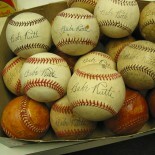 This entry was posted on October 23, 2018 by Memorabilia.Expert BidAMI in Authentication Tips and tagged 1937 Yankees world series, Sports.